Afghan President Hamid Karzai is in India to press for more military aid, ahead of the withdrawal of Nato-led forces from Afghanistan in 2014. He is set to hold talks with Indian Prime Minister Manmohan Singh as well as President Pranab Mukherjee. India already trains some Afghan military officers, but there has been little assistance in terms of hardware. Last November, Delhi signed mining and development deals and pledged $2bn (£1.3bn) in assistance to Kabul. Correspondents say the two countries are strengthening their ties as the US and its Nato allies prepare to leave Afghanistan next year. Mr Karzai's spokesman said that on this trip Afghanistan would seek "all kinds of assistance from India in order to strengthen our military and security institutions". But analysts say that Indian military involvement in Afghanistan is likely to be viewed with suspicion by regional rival Pakistan. 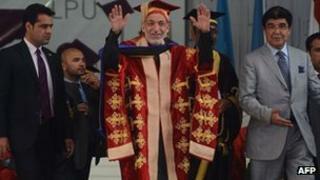 On Monday Mr Karzai accepted an honorary degree from a university in the northern state of Punjab. The Afghan leader thanked India for its support in his degree acceptance speech at the Lovely Professional University. "India, as a friend of Afghanistan, has made an immense contribution in uplifting its youths," he was quoted as saying by the Press Trust of India news agency.